The last week or so of my life has been pretty interesting. I had one of those moments where either, you were just going to crawl up in a ball and cry, or laugh historically at the hand life has dealt you. You mom’s out there that have kids out of school on summer brake right now know what I’m talking about. It had been a really long day of cleaning up one mess right after the other, and after all morning of working, my house still looked like a reck. On top of having to listen to the constant fighting of the 7 and 5 year olds that aren’t used to being around each other all day. Then my hubby tells me that his crew at work had been asking when I was going to send treats again. At this point I was glad to have an excuse to make desserts, and happy to have somewhere to send them, and I guess the day hadn’t completely wiped me out cause I was feeling pretty inventive. I had some left over Mini Reese’s Peanut Butter Cups and some Mint Oreo Fudge Cookies, so I figured, let’s make some stuffed cookies. I love anything with a surprise in the center. It’s like dessert on steroids in my opinion. So, totally motivated I start making my chocolate cookie dough to rap around my left over goodies. Everything was going good, put the cookies in the oven to bake, and then the cookie dough totally flattens out. As I’m standing there thinking, “ok how can I fix these to make them look pretty,” my husband walks up, starts to giggle and says, “They look like brown eggs.” The expression, “Don’t poke the bear,” came to mind and if looks could kill mine probably would have. Pour guy gave me the “ok then, I’m just going to walk away now” look and exited. As I turned back around to look back at my cookies and brainstorm some more, I just had to laugh. They totally did look like brown, sunny side up eggs. So above is my sunny side up chocolate cookie with the peanut butter cup center. I found that it was so much better to chop up the Oreos or Reese’s and put the chunks in the center of the cookie dough instead of whole. Then rap the cookie dough around the filling, kind of like what I did with the Coconut Dream Stuffed Cookies. I should of taken a picture, but there is a picture on the Coconut Dream Stuffed Cookies if you click on the link. Basically make a little bowl out of your cookie dough and then place your cookie or candy bits in the center. Then just pinch the top closed and role in your hands to make round and even out any thin spots in the dough. Make sure your hands are coated with flour to keep the dough from sticking. Enjoy!! In a large bowl, add the butter and sugar and cream together with a hand mixer. Add the eggs and vanilla extract to the creamed mixture and mix until combined. 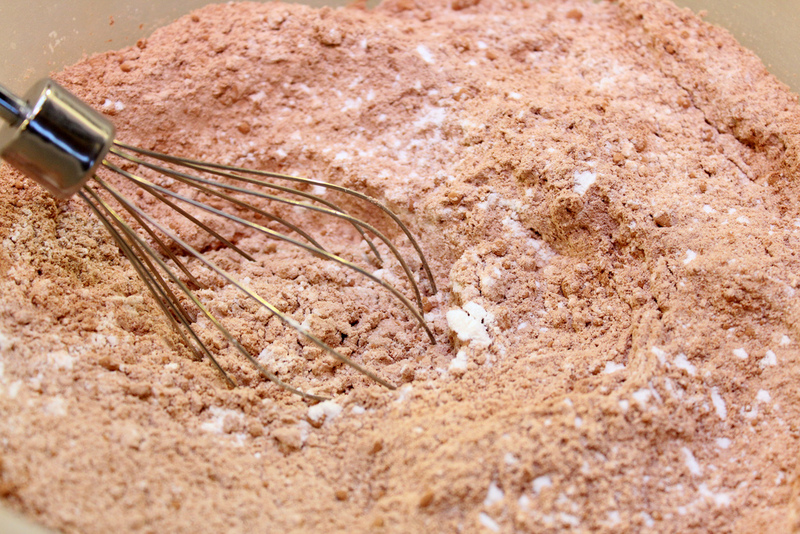 In a medium bowl, mix the cocoa powder, flour, baking soda, and salt. Slowly add the dry ingredients to the butter mixture and continue mixing until incorporated. Refrigerate dough for at least an hour. Preheat oven to 350 degrees. Take one heaping cookie scoop of dough and form into a small bowl. Add the chopped sweets or candy of choice. Close opening up dough around center and roll in hands. Place on a parchment paper lined cookie sheet and bake for 8 to 10 minutes. Cool for a couple minutes before removing to wire rack. Makes about 36 cookies.